Lisca Arles and Lisca Nizza from Didymos are 100% organic cotton. They’re 210 and 200 GSM respectively, which makes them thinner wraps. With the similar blend, weight and weave they have identical wrapping qualities. Didymos have been making baby wraps since 1972 and are widely considered to be the 'grandmother' of the modern babywearing brands. They’re a German company, experienced in selling & shipping worldwide, and their website is available in several languages including English. Didymos's experience, and focus on the safety and well-being of children, with attention to social and ecological ethics, has resulted in a brand that babywearers around the world have come to trust for affordable quality. When I first started looking into baby wraps, Didymos was one of the names that my babywearing friends immediately suggested I try. Sure enough, one of my very first wraps was a 'Didy', and my first Mei Tai a 'Didytai' so I'm always really excited to be offered the opportunity to test and review their wraps. The classic Didymos Lisca design is a ‘herringbone’ or ‘broken twill weave’. The wrap geeks amongst us will be interested to know that the earliest known examples of herringbone weave fabric date back to around 400BC and were found in what is now Italy. It’s thought that the design is based on the arrangement of paving stones in the roads of the ancient Roman Empire. There’s a reason the weave’s popularity has lasted all this time. It creates an attractive, distinctive fabric that’s typically hard wearing and strong but has a good drape. Lisca Arles is named for the French city which, appropriately for herringbone, used to be a provincial capital of Ancient Rome. Van Gogh rented some rooms in a house there in 1888 and it was the subject of his painting ‘The Yellow House’. I suspect that his colour palette inspired the name of this pretty, cheerful wrap. Lisca Arles incorporates sunshine-yellow, pale grey and ecru threads which create a colour scheme that’s perfect for spring and summer. In German, the French city of Nice is known as Nizza, and I suspect this is the inspiration behind the name of the second of these lovely Lisca wraps. Certainly, I can imagine the colours of the Côte d'Azur when I look at the turquoise threads alternating with deep reddish brown against the ecru warp. Didymos’s Lisca wraps are known for their out-of-the-box softness. Certainly, Arles & Nizza require no breaking in and feel as cuddlesome and soft as a well loved baby blanket from the first wash. In hand the wraps feel light, breathable and floaty, with a fine ribbed texture. Arles and Nizza glide into place when wrapping and are extremely mouldable with considerable diagonal stretch. The ribbed herringbone texture provides a good amount of grip so everything holds in place. The softness, mouldability and stretch make Arles & Nizza perfect wraps for a newborn or small baby. Sadly, it’s some time since my boys could be called either of these! My youngest is now 14 months old and my eldest a very big for his age 3 year old. With two rapidly growing boys, I tend to look for wraps that are a little bit sturdier and thicker than Arles and Nizza so I was apprehensive about how supportive they’d be. 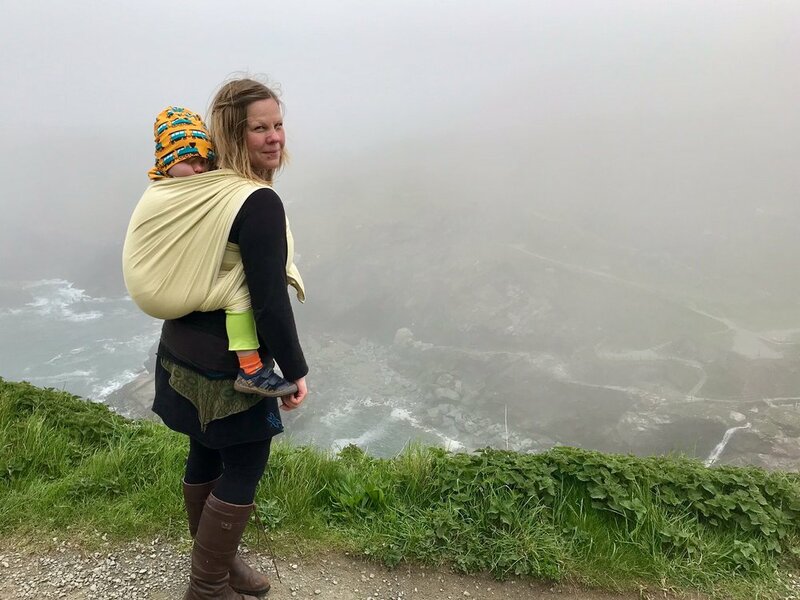 I was testing Arles in a size 6 and Nizza in a ring sling and I was a little nervous as we set out on the climb up to the cliff top castle of Tintagel with my 14 month old in Arles in a double hammock. I was however very pleasantly surprised. Arles didn’t sag and was comfortable for both of us. That wasn’t the end of the surprises Arles had in store either. Our three year old started to feel poorly and upset in the wind and sea mist at the top of the cliff and wanted to be wrapped. I put him up in Arles in a quick double hammock and ended up carrying him all the way home. I definitely felt his (considerable!) weight, but Arles was sufficiently supportive in a multi-layer carry to ensure we got back safely and comfortably after a walk of well over an hour. Lisca Nizza worked well as a ring sling with my 14 month old and was perfect for trips to the beach and quick ups. It’s very compact when folded and makes an ideal sling to have in your bag for those ‘just in case’ moments. The ring sling was very easy to tighten, but the herringbone grip stops the fabric from sliding back through the rings. Lisca Nizza and Arles would work well in base -2 for a baby or toddler, or in a short wrap for quick ups. I recommend getting a longer wrap for secure carries with multiple passes if you intend to carry a very large wrappee (like my preschooler), or are carrying a toddler for longer periods of time. Lisca Arles and Nizza are extremely easy care and can be machine washed at 60 degrees and tumble dried. They come out of the drier with minimal creasing and require little ironing. Lisca Arles and Nizza are super soft, mouldable and perfect for a new baby or novice wrapper. I can’t imagine a better baby shower gift but Arles and Nizza will last you well beyond the early days. With the right size and carry, these versatile wraps will serve you through toddlerhood and beyond. Lisca Arles and Nizza will be available to buy from the Didymos website very soon. You can also follow Didymos on Facebook & Instagram to get the heads up about their news and new releases.